Chances are you’re reading this because you’ve invested heavily in your GIS systems by building your own GIS-based web applications, and you’d love to maximize that investment inside Maximo. MapEngine’s plug and play capability allows you to do just that. For instance, your GIS team develops some cool, business-specific ArcGIS Server web applications. By design, those applications have components, dialogs and web services (CDWS) that provide a common UI throughout the applications. Your team then plugs those CDWS into MapEngine, giving the maps in Maximo the same look, feel, and interactions as your other applications (plays nice in Maximo). With MapEngine, you can plug and play your homegrown ArcGIS web services and components in Maximo. 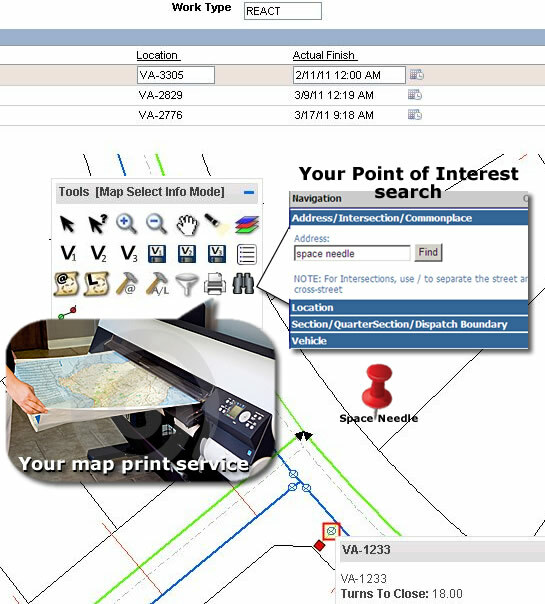 So go ahead, create your own map print web service with legend, compass, logo, etc. ; set up a customer, address and point of interest map search dialog specific to your business; create other componentized business-specific GIS/map functionality in your GIS web applications—whatevs. Maximize that GIS application investment by plugging it and playing it in Maximo with MapEngine™. This entry was posted in MapEngine, News on May 17, 2011 by ActiveG.